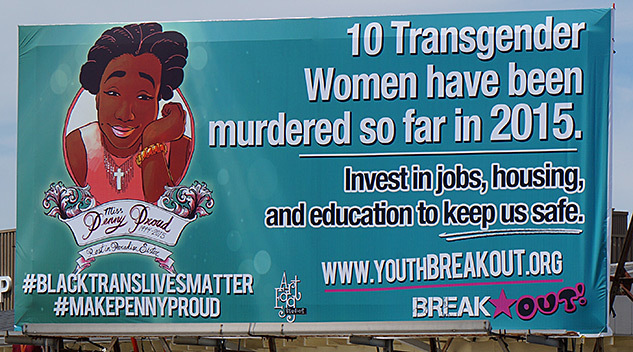 BreakOUT!, an LGBT youth of color activist group in New Orleans, has put up a new billboard commuters can't ignore. New Orleans LGBT youth of color activist group BreakOUT! has one simple question: Where is the national outrcry over the murders of trans women of color? Already this year, nine trans women and gender-nonconforming people have been killed in the U.S., with others likely going unreported or misgendered in death — an average of over two a month, in a consistent trend that the National Coalition of Anti-Violence Programs considers of "epidemic" proportions. Worldwide, a trans woman is killed nearly every two days. The vast majority of these women are black or Latina. Yet these deaths often fail to appear in national headlines, and local reporters too often misgender trans victims of violence, in violation of journalistic best practices endorsed by the Associated Press and GLAAD. BreakOUT! has emerged this year at the forefront of urging media sensitivity and attention, but progress has been slow. So this month, the youth group took matters into its own hands, erecting a can't-miss-it billboard over the Broad St. Bridge in New Orleans. "BreakOUT! 's solution [to media silence]? Make our own media," the group's youth organizer, Milan Nicole Sherry, tells The Advocate. "Develop our own message. Make it so big — over 24 feet wide, in fact — we can't be ignored." The enormous sign is seen by 400,000 commuters and passers-by each day, Sherry estimates. It is currently scheduled to remain up for two months. That means hundreds of thousands of people are getting this daily reminder: "Ten Transgender women have been murdered so far in 2015. Invest in jobs, housing, and education to keep us safe." The billboard displays an illustration of Penny Proud, a 21-year-old local black trans woman murdered February 10 in a suspected robbery. Popular social media hashtags "#BlackTransLivesMatter" and "#MakePennyProud" are displayed beneath her smiling portrait. The billboard's proclamation that 10 trans women of color have been killed this year includes Vanessa Santillan, a Mexican trans woman who had been living in Miami, until she was beaten to death earlier this year while visiting the United Kingdom. Inspiration for the billboard — which was funded largely by New Orleans's Awesome Foundation and the Urgent Action Fund — came in large part from Proud's story, Sherry explains. While BreakOUT! 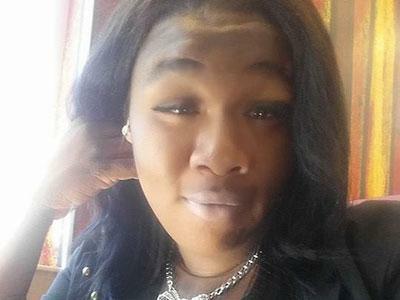 was working on releasing a public statement in February about the six trans and gender-nonconforming people of color who were murdered in the U.S. prior to Proud, the group was stunned to learn of the young woman's death. "We were wrapping up a meeting about how little value is placed on the lives of black and Latina transgender women when the issue suddenly hit much, much closer to home," Sherry recalls. "Penny Proud ... had just been found dead in New Orleans and already misgendered in the media." BreakOUT! quickly released a revised statement, mentioning Proud's death, then took a lead in calling on New Orleans newspaper The Times-Picayune and other sources to adhere to respectful journalistic standards when reporting on her death. Realizing that the misgendering of Proud in Times-Picayune articles derived in part from inaccurate police reporting, Sherry says BreakOUT! also contacted federal monitors for the New Orleans Police Department Consent Degree. The group held a community vigil, provided support for Proud's family, and fielded media requests about the murder — only two of which came from local reporters, including one from The Times-Picayune. "And then, two more transgender people were murdered in the U.S.," Sherry says. "Then another — raising the death toll to at least eight in just under two months." The group recognized its media education efforts had only just begun — and considering the statistics, it's not hard to see that this issue will take concerted efforts to address. NCAVP notes that in 2013, the vast majority — 72 percent — of reported anti-LGBT hate crimes were against trans women of color. When trans women of color who survived these crimes went to authorities with their experiences, they were seven times more likely to be subjected to verbal and physical abuse from the police in response. If detained, trans women of color often tell stories of mistreatment by authorities, and they are likely jailed in men's facilities, where they may face denial of health care, an increased risk of sexual assault, and even solitary confinement. These realities are largely why BreakOUT! 's billboard includes a call for investments to make a difference: investments in the jobs, housing, and education of trans women of color. All of these aspects are correlated with better health and socio-economic outcomes for this demographic, which faces a four to six times greater likelihood of living in poverty than nontrans peers. While BreakOUT! has much more work to do, Sherry says the billboard is making an impact locally, achieving the group's goals to "start a conversation" and "lift up the lives of black and Latina transgender women and all LGBTQ youth of color." The group has seen a response on social media, with some area residents expressing surprise and gratitude at seeing a billboard addressing an issue that still remains largely invisible. On the group's Facebook page, one advocate shares how the billboard "started a whole conversation about the difference between sexual orientation vs gender identity and why this violence is happening!" Another citizen simply says, "I saw a #blacktranslivesmatter billboard on my way to school awesome." But perhaps the most affirming response of all comes from Proud's grandmother, Ms. Nadine — who told BreakOUT! that she'd received calls from several family members about the billboard. "My niece works at the sheriff's office, so she took a picture and sent it to me," she told the activists. "It's important to get the message out that all lives matter, no matter what gender they are. Thank you again."